The Chevron Foundation has awarded the Louisiana Universities Marine Consortium (LUMCON) Education and Outreach Department a total of $59,000 to support an existing education program and fund two new initiatives. The award will eliminate the cost for high school students to attend one of LUMCON’s 2019 summer camps, fully fund an oceanography technology camp for high school students, and establish Marine Science Clubs for the first time on four university campuses in the state of Louisiana. LEAD Camp: Chevron Foundation funds will allow students to attend LUMCON’s Estuarine Awareness and Discovery (LEAD) Camp 2019 for free. LEAD Camp gives high schoolers a week of scientific coastal exploration aided by LUMCON’s research vessels, kayaks, oceanographic equipment, laboratories, and science and education staff. In addition to advancing students’ understanding of the scientific process and marine ecosystems, LEAD Campers join LUMCON’s vibrant summer community and expand their network to include ocean experts from a variety of backgrounds. LEAD Campers that show they are hardworking and passionate about science commonly return to the Marine Center as student instructors, research interns, science technicians, and a variety of additional career advancement opportunities. Remotely Operated Vehicle (ROV) Workshop: Eighteen high school students will attend a Remotely Operated Vehicle (ROV)-building camp held at LUMCON’s DeFelice Marine Center, funded entirely by the Chevron Foundation. This one-week, residential workshop will give students access to marine scientists and industry specialists as students build and learn about underwater technologies and robots, and take part in data collection with an underwater vehicle during a cruise on one of LUMCON’s research vessels. Students will learn to apply skills and knowledge in several STEM disciplines, become part of an ocean exploration community, and meet potential future mentors and employers that may broaden their career possibilities in the future. A student lowers a remotely operated vehicle (ROV) over the side of LUMCON’s R/V Acadiana before testing the vehicle in the ocean. This ROV was constructed by students at an ROV-building workshop held at LUMCON in 2016. 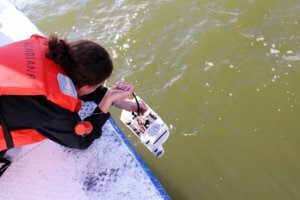 Marine Science Clubs: LUMCON will establish Marine Science Club chapters on four Louisiana university campuses with the goal of eventually establishing chapters on all higher education campuses in the state. Marine Science Clubs will serve LUMCON-member institution students that are unable to take full advantage of opportunities offered at LUMCON’s DeFelice Marine Center. With funding provided by the Chevron Foundation, these clubs will provide students with free access to marine science learning opportunities and experiences that would not otherwise be available to them, including traveling to LUMCON’s DeFelice Marine Center for overnight field trips, coordinating and facilitating a service project, and meeting with marine science mentors and experts on club campuses. “We are thrilled to find a partner in the Chevron Foundation as committed and passionate about STEM education as LUMCON. These generous funds will allow LUMCON to connect with a diversity of students and enrich their educations with innovative skill- and place-based STEM programs,” stated Dr. Craig McClain, Executive Director of LUMCON. LUMCON is a consortium of Louisiana’s higher education academic institutions. LUMCON endeavors, through research and education, to focus and strengthen the effectiveness of foundational marine science needed to address environmental and socioeconomic challenges facing Louisiana and the nation. LUMCON’s Education and Outreach programs are place-based, skill-based, and immersive: students become scientists when they work with LUMCON. These Education and Outreach programs impact roughly 6,500 students annually, most through field trips during the academic year. For more details and information on LUMCON’s Education and Outreach program, visit https://lumcon.edu/education-and-outreach.